Geoff Thurtell and I have just got home after an exhausting day! 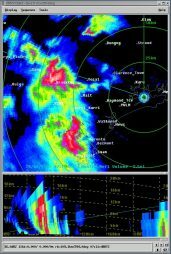 We targetted Cassilis but met the first storm NW of Gulgong. 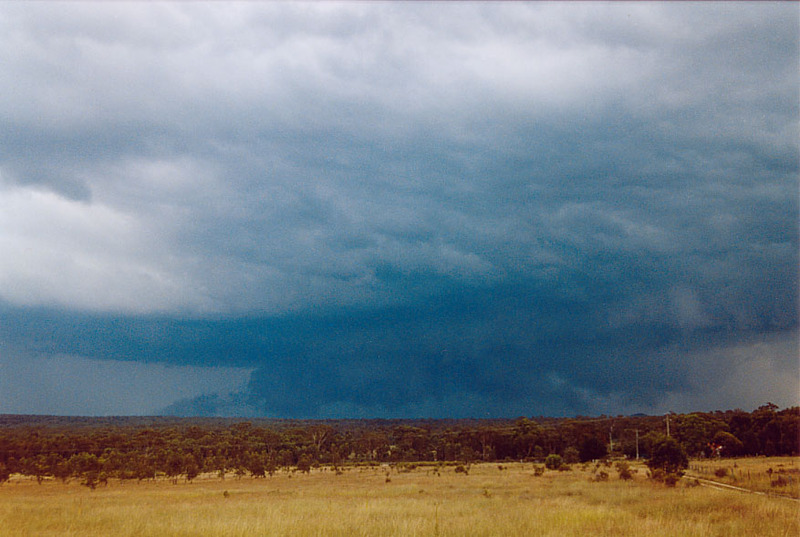 This became the first supercell storm A. Not wanting to get in the path of it, we headed for Cassilis and Merriwa. We did eventually get to it after a reminder from Jeff Brislane. Another storm was dveloping near Merriwa storm B.Strangely, it did not seem to show great structure but interesting back end which was timelapsed. 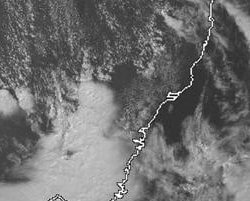 We paralleled this storm to Jerrys Plains and south of Singleton. 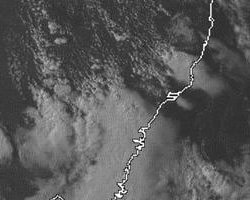 The emphasis was to get onto this one now near Cessnock but I became more interested in the storm B making a sharp left move - destination Singleton! I filmed some strong cloud to ground lightning bolts and a massive rainfree base. Inflow into this storm was fresh to strong E. A probable hook or inflow notch may have developed at this point. Via Branxton, we headed north. Unfortunately the road was not the most ideal and it meant we had a collision course with the supercell. quote - from the Bureau warning: From the latest Warning. 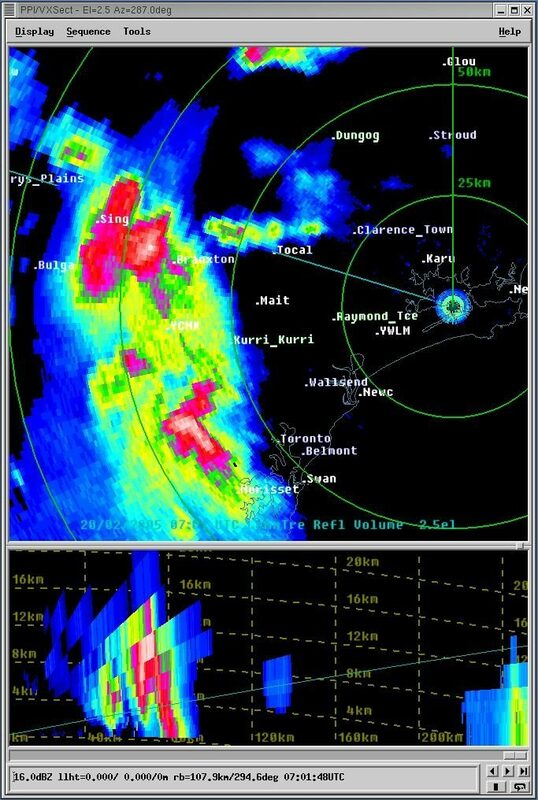 "The Bureau of Meteorology has just received a report of 8.5 cm hail from this thunderstorm, resulting in smashed car windscreens near Singleton." Yes this warning was sparked by our observation and unfortunately, I have done in my windscreen. It was not the plan darn road. We have video of the windscreen getting busted. Upon examination of the vehicle, the front left head light was broken and the right side mirror also has no mirror. I most certainly was Jimmy's 'offsider'for the Sunday 20th chase. It will be one to remember for years to come! 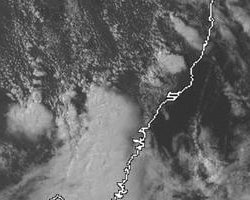 Thanks to Jimmy for his spot on analysis of the forecast charts that enabled us to be on to this storm system right from it's genesis in the Gulgong region. We had a brief doubt about our strategy when we took the better road to Cassilis and along the Golden Hwy to Merriwa (rather than the rougher, slower Wollar - Bylong - Sandy Hollow road). 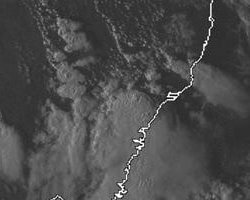 We connected with the system again at Merriwa and were able to watch the rapid development of the northern cell from Denman. 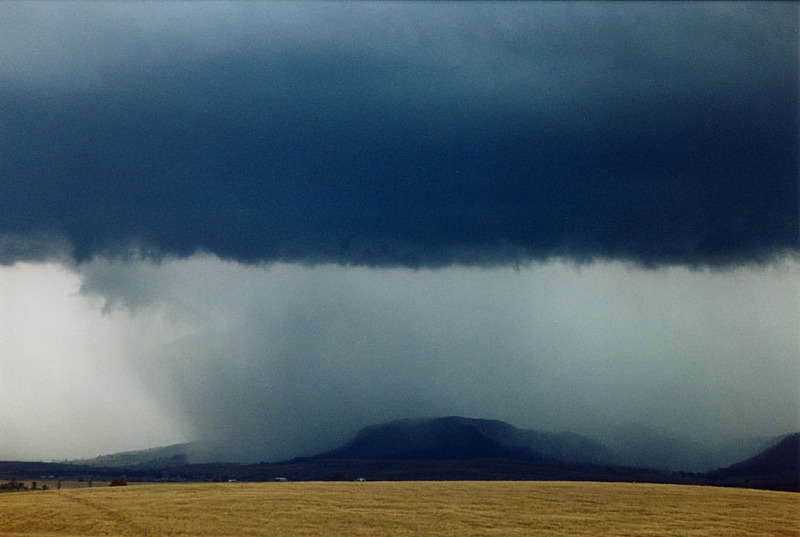 Just south-east of Jerrys Plains we witnessed explosive development of the storm with intense rain-hail shafts seeming to connect the ground with the clouds. The numerous close CGs striking an open paddock to our north were awesome. The first of the heavy rain/small hail overtook us about 9km south of Singleton. We continued east and managed to get ahead of the storm again west of Branxton. At Branxton we turned north along the Gresford Rd through Elderslie. At Elderslie, we actually made a mistake and got off the Gresford Rd and onto a road that would have eventually taken us east, then south. Little did I know that when I stopped Jimmy and asked him to turn back onto the Gresford Rd, that I had committed us to the intense fully developed core of this monster. The rain was so heavy that it was almost impossible to see the road. Those of you who saw the footage on ACA would have heard me directing Jimmy back onto the lefthand side of the road. We had become momentarily disoriented in the intense rain and I was amazed to see the centre line of the road appear on my left! 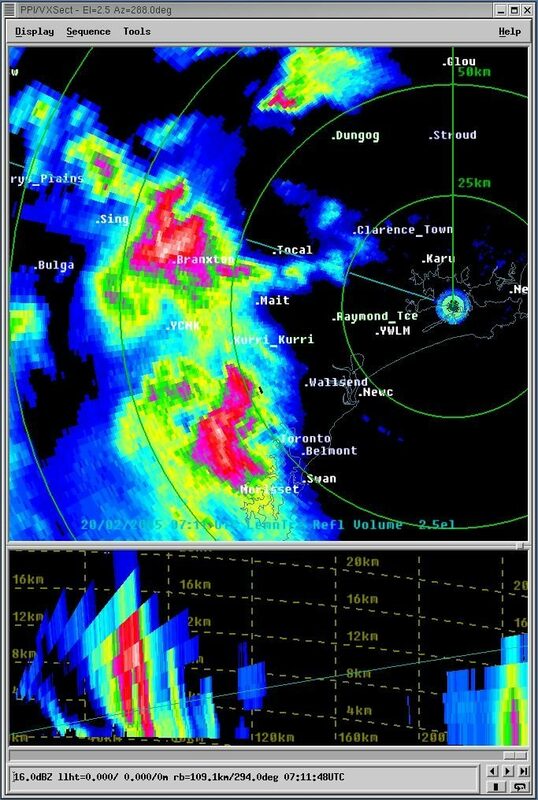 It was not long after this (about 3 km north-west of Elderslie) that there was that spooky lull in the smaller hail followed by the crushing blow of a full on microburst containing supercooled, hard 8.5 cm hailstones. The sight of the windscreen being shattered and the sound of the hail thumping into the bodywork of Jimmy's car is something that will be etched into my mind forever. Fortunately we were able to get onto the lee side of a clump of trees and this protected us from further 'direct hits'. While we were stopped, a nice shiny almost new Mercedes Benz went past us going in the opposite direction. I would not want to see that man's repair bill. When the hail stopped we went a little further along the road, dodging fallen branches and small trees. We pulled over on a side road and Jimmy jumped out to grab some of the hail so that we could measure it. As I put Jimmy's video camera down, I realised that my hands were shaking. A mild shock had affected me after the worry of wondering if there was a big one up there that was going to smash through the side window or the weakened windscreen. Fortunately, if there was a super big one amongst the "average" 8.5cm hail, it didn't fall on us. After that we just continued on to Gresford, Dungog and down the Buckett's Way to the Pacific Hwy and then back to Sydney. We witnessed a fantastic lightning show for most of the journey south, which we normally would have stopped to video and photograph. After that afternoon's events, the lightning was more of an anticlimax and so we just took it all in as a postscript to our rather full day and motored on south down the F3 through more intense rain.